Whether you’re looking for a quick cheap snack after a hockey game or looking to cool off during the summer with a big bowl of delicious fried ice cream, Sam Diego’s has what you are looking for. As students at Barnstable High School and as locals of Cape Cod, we all know and love the restaurant Sam Diego’s. Located on 950 Iyannough Rd in Hyannis, it is a general location that is easy for students to get to from either Barnstable High School, the HYCC, Craigville beach, and just about anywhere else. Not only is the location hard to beat, but the menu has so much to offer. 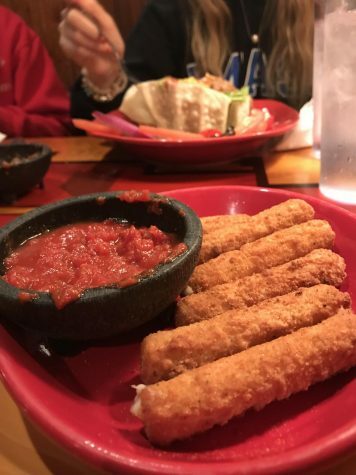 Although Sam Diego’s is coined as a Mexican restaurant, it still has other selections on the menu such as mozzarella sticks, chicken fingers and fries, and salads. If your friends are craving a burrito but you are craving a burger, you are in luck at Sam Diegos. Though if you do have a craving for queso and chips, the Mexican food selection is vast. Our most recent visit to Sam Diegos, although there has been many more, was nothing short of great. We got the “Sam’s Big City Burrito” which has ground beef, rice, black beans, cheddar cheese, and is topped with green chile, melted cheese, and sour cream. We also got the mozzarella sticks, and fried ice cream. The burrito was very delicious and at a small price of $13.45, it was still able to feed two people. Not only did we get the food we ordered, but as soon as you sit down you get free chips and salsa that the waitress continues to refill until you get your meal. You will never walk out of Sam Diego’s hungry! The best part of the meal by far was the Fried Ice Cream; which is always my favorite part of the meal at Sam Diego’s. The meal came out to $28.29, which is a great deal for a super filling and delicious dinner!